1. Emoji Heart Eyes Cushion £19.99 [x] : I don't know about you but the heart eye emoji is my absolute fave! Plus how cute is it in cushion form? Want, want, want! 2. Golden Magnetic Polaframes £16.00 [x] : A while ago I featured magnetic polaframes, but I've fallen in love with this cooler classier version in a metallic finish. Perfect if you want to add a bit of classy fun to your fridge. 3. Yay Cake Topper £5.50 [x] : If you're having a party soon, why not pick up one of these super fun Yay cake toppers. I'd be so happy if I had one of these on my birthday cake. 4. Hip Coffee Stencils £8.50 [x] : If you fancy being your own trendy barista at home, pick up some of these cool coffee stencils and create some of your own coffee art. 5. I'm Outta Here Getaway Passport Holder £26.00 [x] : Isn't this just so pretty? Overpriced yes, but so pretty! Perfect for anyone who loves to travel in style. 6. Sassy Girl Sterling Silver Emoji Ring £24.00 [x] : A sassy girl emoji ring?! Yes really! This is a perfect gift for anyone who's a bit sassy and loves to spam the sassy girl emoji. Thank you for reading lovelies - and have a Happy Monday! I agree! the cushion is too cute! 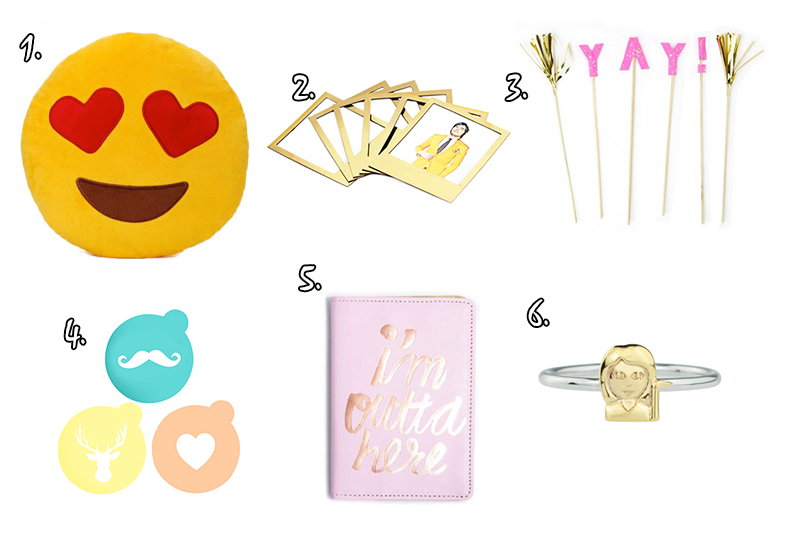 The sassy girl emoji ring has to be one of the cutest thing you featured on this series, Vicky! I do think the price is a wee bit high but it's so freaking cute that I am tempted to buy it! The passport case is amazing!!! Haha do add it to your wishlist! Omg those polaframes are so such a good idea! May have to get some! I love the polaframes, they look so pretty!